The Ray Foster Cyclone Dust Collector is a powerful and efficient dust collector for use in the dental laboratory, designed for trouble-free performance and heavy-duty operation. Quiet, portable, and compact, the dust collector is ideal for under the counter operation. The deluxe model (CDC2) is rated at an ultra quiet 55 dB. One HP motor, 112 cubic feet per minute (CFM) suction power. Economical, disposable paper primary filter, easily and quickly changed Retains 3 micron and larger particles. Permanent cloth secondary filter for retention of the finest dust particles, insuring long motor life. Supplied with one 6’ long X 2-1/2” ID vacuum hose and four (4) extra disposable paper dust bags. Remote foot switch (item X131), variable speed remote control box (item X145). Uses 1-1/2”, 2-1/2”, or 3” I.D. hose for adaptability to nearly every dust collection devise. 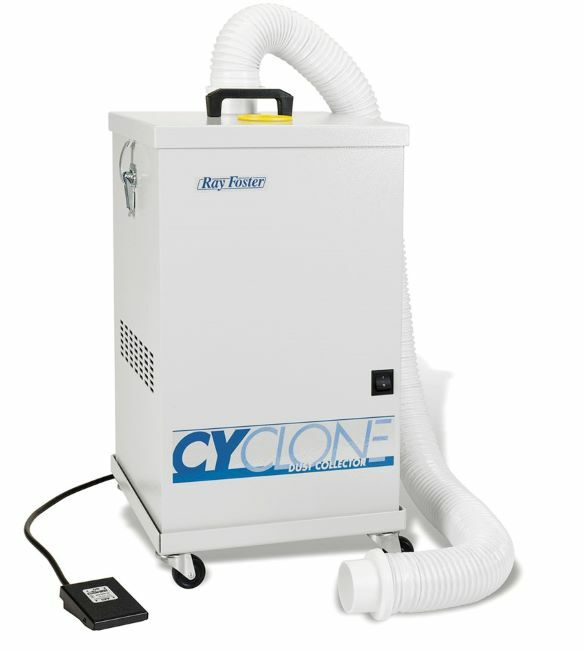 The Deluxe Cyclone Dust Collector features a two stage, ultra-quiet, by-pass motor suitable for use with abrasive blasters, and includes a remote foot switch, and mobile cart.